Step 1 / Brush through the hair to remove any tangles. Step 2 / Then create a deep part on the right side. Step 3 / Pick up a small section on the heavy side of the part and divide it into three sections for the braid. 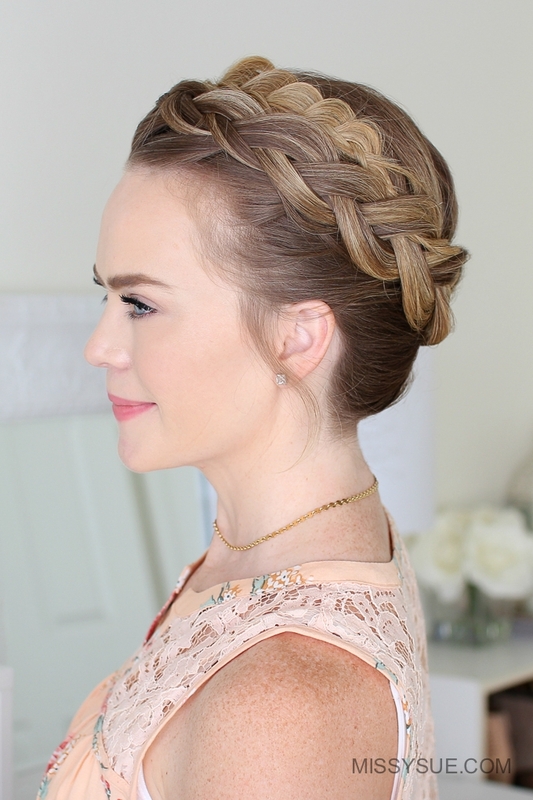 Step 4 / To create a dutch braid, begin by crossing the right strand under the middle strand. Then cross the left strand under the middle strand. Step 5 / Now cross the right strand under the middle strand and pick up a new section of hair crossing it under the middle strand as well. Step 6 / Then cross the left strand under the middle and bringing a new section into the braid. Step 7 / Now repeat those steps continuing the dutch braid down to the left ear. Step 8 / Once the braid reaches the left ear, switch hands and continue the braid around the back of the head. Again you’re bringing in hair from both the top of the head and the nape of the neck and working towards the right side of the head. Step 9 / Before the braid reaches the right ear, make sure to bring all of the hair into the braid. This will help minimize the bumps that pop up on one side of the head. Step 10 / Once all of the hair is brought into the braid, then switch the hands again and braid the rest of the section to the ends in a regular 3 strand braid. Step 11 / Then lay the braid across the top of the head, behind the beginning of the braid, and pin it down with bobby pins. 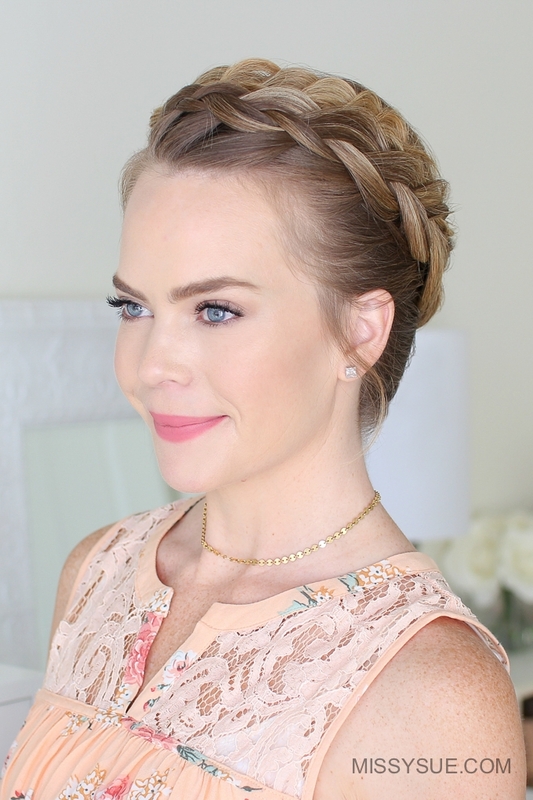 I like to slide mine into the center of the braid, in line with the braid so it stays hidden. Step 12 / Now go back over the entire braid and pull on the edges to make it a lot wider and more full. 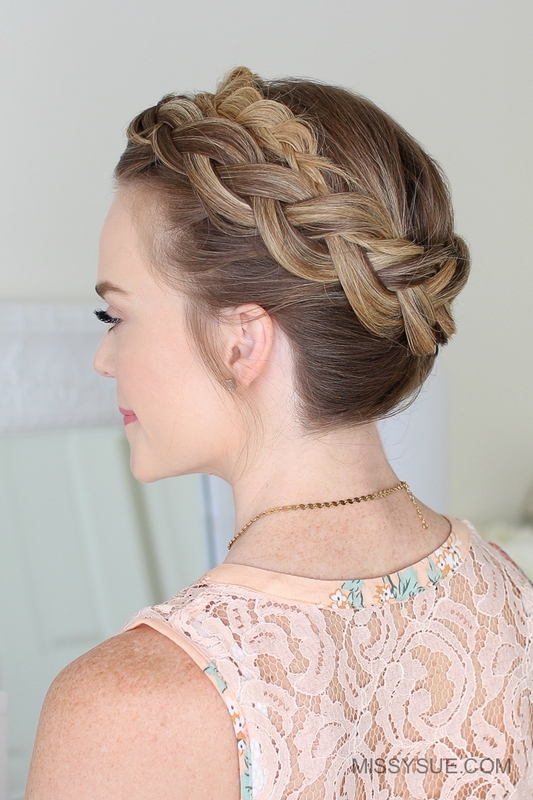 Step 13 / Then spray the style with hairspray and smooth down any hair that is sticking out from the braid. 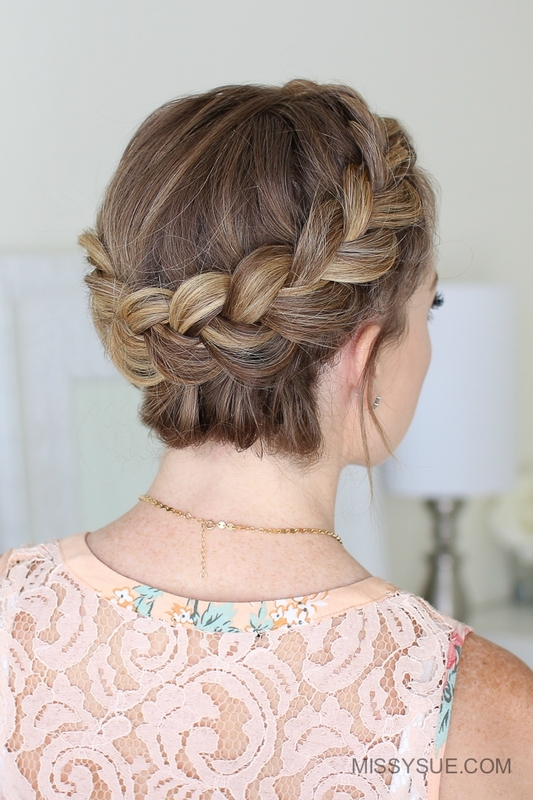 Beautiful hairstyle! You’re amazing! I love all your hairstyles. 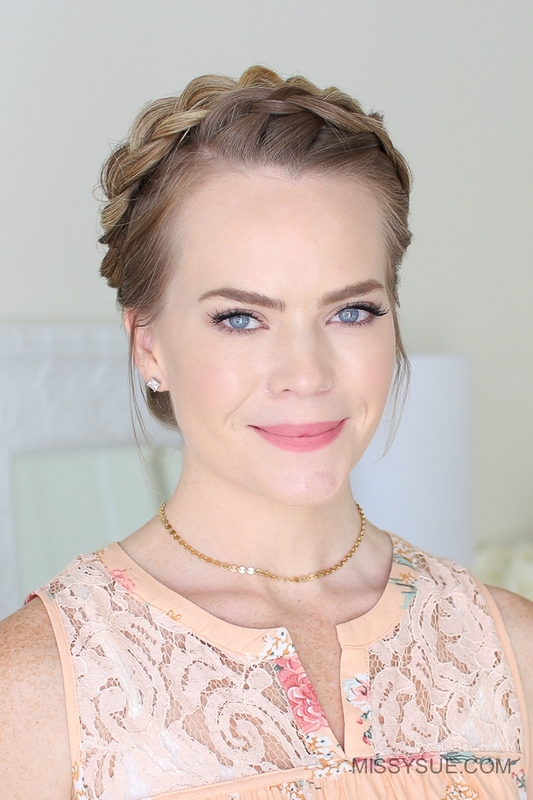 I was wondering if you could maybe film a bobby pin tricks video or hair hacks video? Thank you so much for all the amazing and wonderful ideas! I really appreciate what you do! 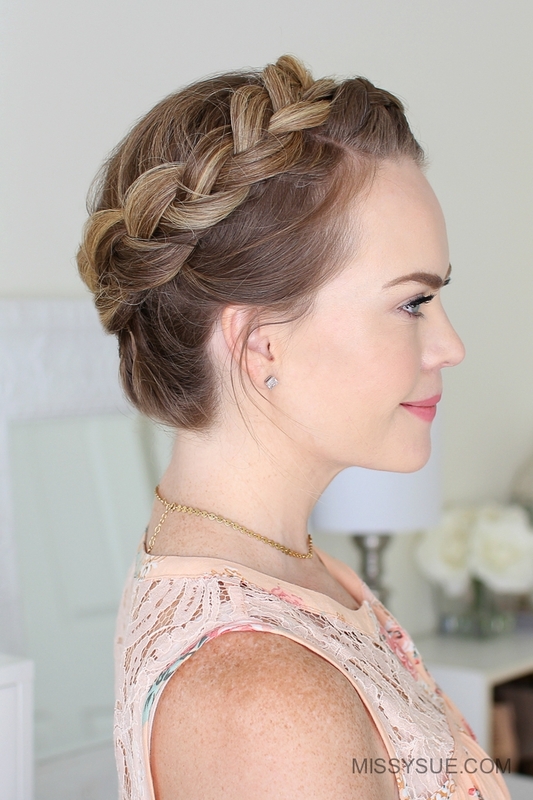 Love this hairstyle. By the way, where did you get your necklace, its beautiful!